Finding the right longboard trucks can get a little bit of an intimidating process. So, when you are looking at how many types of trucks are there on the market, it’s quite easy for anyone to get overwhelmed since there are so many endless options to choose from. But don’t worry we are here to do the work for you. Also, it’s almost impossible for anyone to test ride each and every truck and figure out what works and what doesn’t so there are some key factors to look into when finding those perfect trucks that will tune in perfectly with your style of riding. Either you are looking for trucks for general cruising, downhill or freeriding we’ve got you covered as we think each truck must give the rider a unique ride, right? So stay tuned. 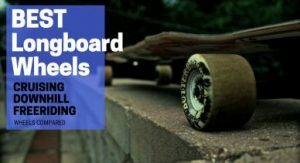 With that said let’s take a look at feature overview of the Top 3 Longboard Trucks after that, there is Comparison Table and Buyer’s Guide where I’ll be answering the questions that confuse you the most when it comes to choosing longboard trucks. So without any due let’s get started! Now, I’ll be reviewing each and every longboard truck that I have covered earlier. 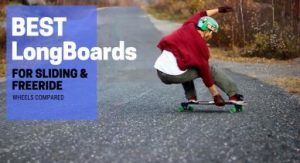 Just a quick overview, I’ll be talking about their pro’s and con’s and why they are good or bad for the certain type of longboarding. So let’s start with the Caliber Cal II. Hi! 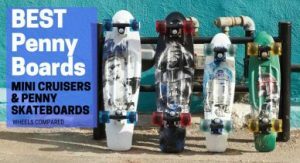 this is Chris Ryan here to help give you a guide on how to choose the longboard trucks. There’s a lot going on here so it can be confusing at times. Hence I’m going to run through the basic features on what makes different trucks better for different types of riding. The first thing we’re going to figure out is what width of trucks you should be getting. Now generally you would want the width of your trucks and width of the full axle to be about the same as the width of your board. So most longboards you’ll be getting are gonna be about 9 to 10 inches wide which is perfectly good to go. Generally, the axle you’re gonna get will be about a 9-inch to 10-inch so that will be good to go. Now, choosing the truck width can be kind of confusing because some companies will measure in inches and some will measure in millimeters. So generally when a company measures in inches, they are talking about the full width of the axle whereas if they measure in millimeters, they are generally talking about the width of the hanger alone. You should be getting the full width of the axle as close to the width of your board as possible but if it’s a little off it won’t be a big deal. Now the next major decision you’re going to make is reverse kingpin or standard kingpin. A standard kingpin is one your standard skateboard truck has that you’ll see on the most park or street skateboards and that’s gonna have the kingpin on the inside tucked away from the surface of the hanger, and that’s done, so it does not get in the way when you are doing coping tricks and ledge tricks. So generally the standard kingpin trucks are going to sit a little bit lower as well so you’re going to get a lower ride height out of them. 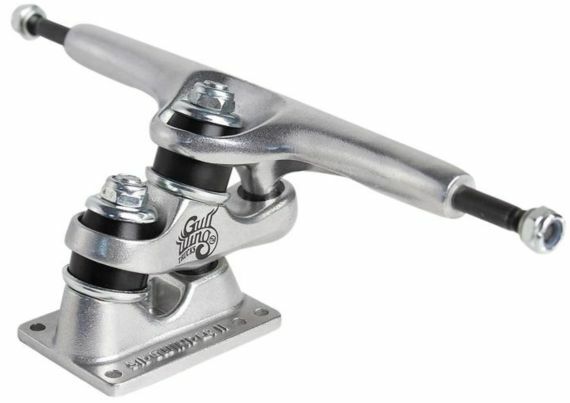 These trucks are great for cruiser decks so if you’re riding something like a 9-inch wide cruiser then its great to have those standard kingpin trucks on there because your gonna have that lower height and if you wanna take them into the park it’s not going to hold you back. But mostly longboarding is done on reverse kingpin trucks and these are going to be a bit taller, and they are going to have the kingpin facing outwards towards the tip whereas the tail where the standard kingpin trucks kingpin faces inwards towards the center of the board. So with the reverse kingpin trucks, you are going to be taller like I said, that’s also gonna make them a little more divvy and responsive generally at slow speeds. Moreover, you’re also gonna get more customizations with the bushing seat and with changing your bushings to make them more stable for higher speed riding. So generally if you wanna do more transportation, cruising, freeride and downhill on your longboard, then you’re gonna generally want a reverse kingpin truck. They also come in larger sizes whereas its harder to find a larger truck with the standard kingpin. Also, a weird little exception to all of this is the Gullwing Sidewinders. These are standard kingpin trucks, but as you can see, there are two of them. So you’ll be getting two kinds of turns with it. Firstly, a really really tight turning radius, very carvey which is great for low-speed riding, transportation and cruising around but as you get a little faster, they’re gonna be very unstable because they do have those two axes of terms. The cool thing about this is if you want a really wide standard kingpin truck you can pull a joint which is in the middle of these Gullwing Sidewinders trucks out and then you’re just gonna have a 10-inch standard kingpin truck. So once you’ve made your decision between reverse kingpin and standard kingpin, your gonna want to take a look at the bushing seats. Now like I said with the reverse kingpin trucks you’ve got a lot more variety of bushing seats to dial in your setup. In general, a wide open, less restrictive bushing seat is gonna give your hanger more room to move around and give you a more lively free/open carving turn. So an open, unrestricted bushing seat is great for carving at slow speed riding like freestyle, mellow freeride and other transportation. Whereas a more restrictive bushing seat is not gonna let your hanger move as freely, its gonna cup that bushing a little tighter. 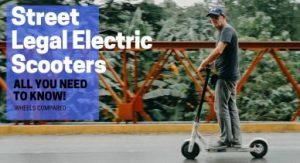 This might be a little more restrictive and not quite as lively for that lower speed riding, but it’s going to make you more stable for the higher speed riding. As for a more restrictive bushing seat, you can always put in a less restrictive bushing that will give you a little more lively turn as well. The final and often the most confusing part to talk about is your baseplate angle. Now the base plate angle is one which dictates the angle at which your hanger will sit at. This tells you a lot about the way the truck will turn. A fifty degrees base plate is more common, and most stock trucks come with a 50-degree base plate. This angle will give you a tall ride height with a lot of turns so if you lean into your trucks just a little bit it’s gonna make them turn a lot. This gives you a very lively and responsive ride, great for carving, cruising, transportation and mellow freeriding downhill. Whereas, a lower degree baseplate is gonna make your hanger generally sit a little bit lower, and that same amount of pressure that you put into the 50-degree baseplate is going to make your turn less on a lower degree base plate let’s say 45 degrees or 42 degrees. So it’s going to be less responsive at a slower speed, but once you start going a little bit faster, it’s going to be more stable because it’s less twitchy and it will react less to the little pumps and imperfections in the road. Also when you’re in a hard corner, you can lean really hard into your truck without over steering and twitching or sliding out. So lower degree base plate is great for faster riding, but if you’re going anything under 30 degrees, I wouldn’t be recommending that. It is because you’re always gonna want to be on a 50-degree baseplate as that would be more lively, responsive and it’s surely going to be more fun and more enjoyable to ride. Now a funky thing that a lot of downhill riders will do is they will ride a taller base plate in the front and a lower angle base plate in the back. What that’s gonna do is, it’s going to make you turn from your front and give you a very stable back truck. And where any speed wobbles will come from is when you get steering out of the back, and this will steer from the back and push the front truck around so that will wiggle and wobble and obviously it’s very difficult to control. So what these guys usually do as a fix is that to put that higher angle base plate in the front so that you can steer from the front and get a nice lively feel and then in that back truck it’s gonna keep it a little less responsive. This will track that front truck better, and you’re less likely to get that back truck steer that’s gonna give you those speed wobbles. So it’s a good thing to play around with if you’re trying to get into downhill and wanna stay more stable. In addition, if you have the same degree truck, you can just wedge your front a little bit or D-wedge your back truck a little bit to make it a little more stable. 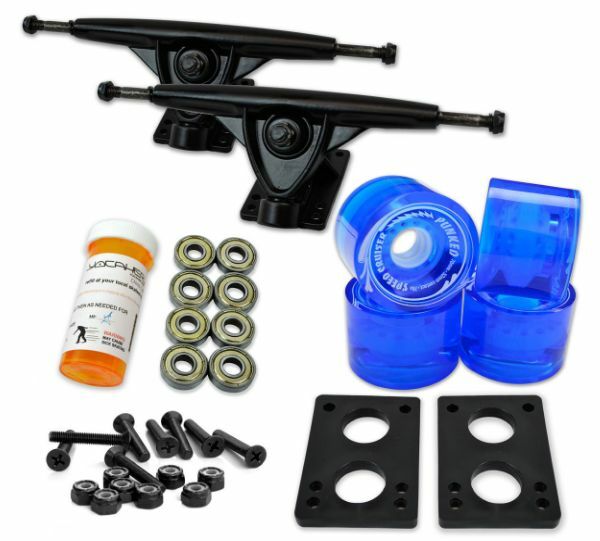 Now no matter what kind of trucks you have you can always customize the way it rides by swapping around the bushings. There are several different shapes of bushings you’ve got cones, you’ve got stepped cones, barrels and eliminators or stepped barrels too. Cones are gonna be least restrictive, and your stepped barrels or eliminators will be most restrictive. 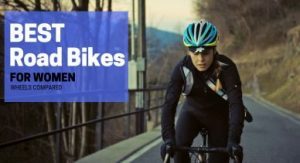 So, if you want a nice lively feel go with something less restrictive but if you want something for faster riding go with something that is more restrictive. This goes without saying that softer bushings will be more lively and playful whereas harder bushings are more restrictive. now there are some guidelines here but it’s all based on personal preferences so if you’re lighter go with something softer and less restrictive. 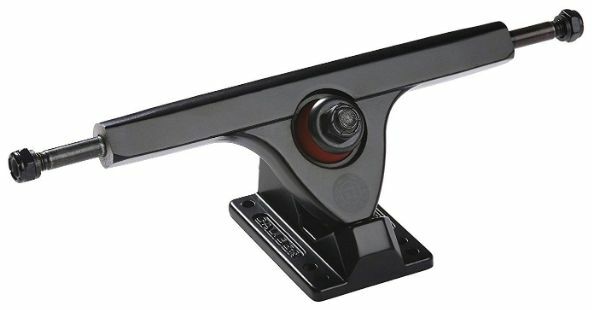 If you are a bit heavier, go with some harder, more restrictive thing but you really just gotta play around with it based on what type of riding style you do and what kind of feel you want your trucks to have. 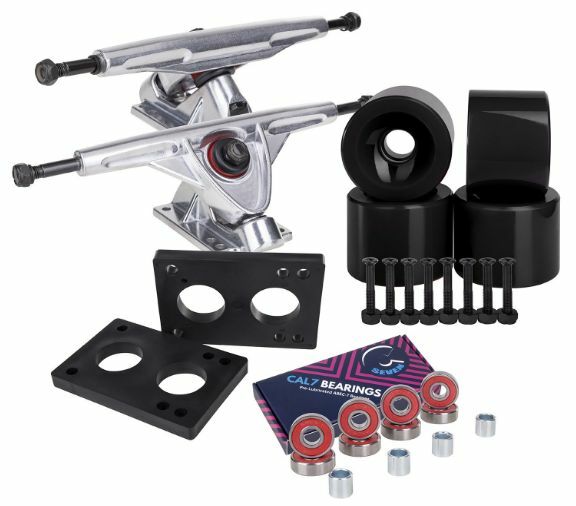 Luckily bushings are cheap so pick up a couple of sets and get used to customizing your setup so you can dial it in and make it feel as good as possible. 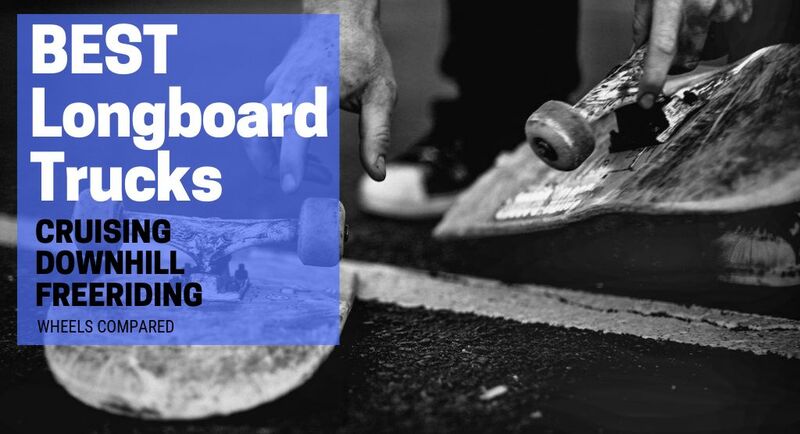 That’s just about everything that you need to know about choosing your longboard trucks. If you have any more questions feel free to ask in the comments section below.